Peach Sour Cream Pie - Do You Know The Muffin Man? Notes: Instead of the sweet pastry found in the magazine, I used the rest of the pie dough from last week's plum tart. 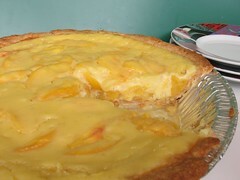 There are a lot of recipes for this pie on the Web with wildly differing proportions of sour cream, sugar and peaches. I only needed 10 minutes at the higher temperature because the crust was beginning to brown, and then a full 30 minutes at the lower setting. This pie was too tangy for me: the sour cream and lemon zest reinforce the slightly tart peaches. Served with ice cream or whipped cream, it might be alright, but not on its own.